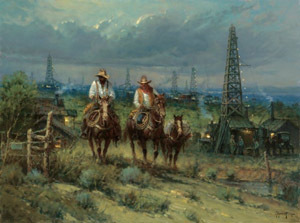 Some of G. Harvey's most popular images have been of the oil fields when cowboys rode their horses among the towering derricks as they struggled with the change that would necessarily come. Oil Patch Cowhands is a particularly beautiful rendition: peaceful, yet with the hint of how the land and lives would change. Oil Patch Cowhands copyright© 2006 by G. Harvey is prohibited from being copied. G. Harvey art, western, oil well, texas oil wells, cowboys, texas, artwork, art work, canvases, images, paintings, pictures, and prints of Oil Patch Cowhands by artist G. Harvey for sale. 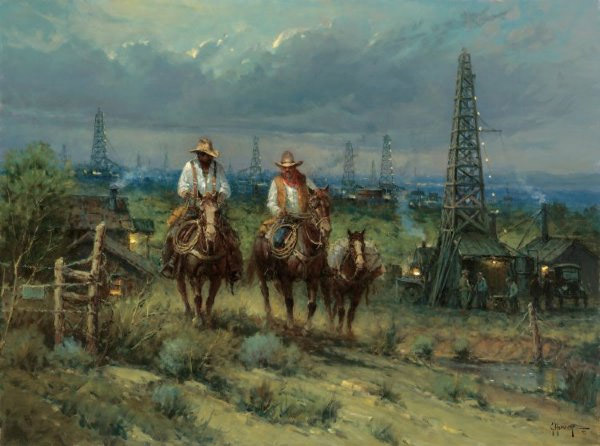 Oil Patch Cowhands painting by artist G. Harvey can be purchased in art print or canvas form at special sale prices at Christ-Centered Art.